Ozone both helps and harms us. China’s smog-choked air is already a public health crisis, with around 1 million deaths attributable to air pollution every year, according to the World Health Organization. But as the government works to dissipate the gray haze blanketing the country’s cities, an invisible killer is rearing its ugly head: ozone. It has the country’s public health experts worried. Ozone is best known as the layer of gas in the earth’s atmosphere that protects humans from harmful ultraviolet rays, exposure to which can cause cancer and other health issues. Indeed, China came under global criticism for failing to control domestic emissions of chlorofluorocarbons — or CFCs — chemicals that deplete global ozone levels and increase health risks. However, less well-known is the fact that too much ozone at the ground level is also a public-health threat. Air with high ozone concentrations can damage cells in the lungs and other organs. In China, an estimated 316,000 adults died in 2010 from respiratory illnesses caused or aggravated by ozone pollution, according to a study into long-term ozone exposure published in 2017 by the journal Environmental Health Perspectives. In addition, roughly one-quarter of the world’s ozone-attributable respiratory deaths occur in China. Ozone accumulates when airborne nitrogen oxides — mostly produced by coal burning and vehicle emissions — react with volatile organic compounds (VOCs), organic chemicals that evaporate easily, even at room temperature. 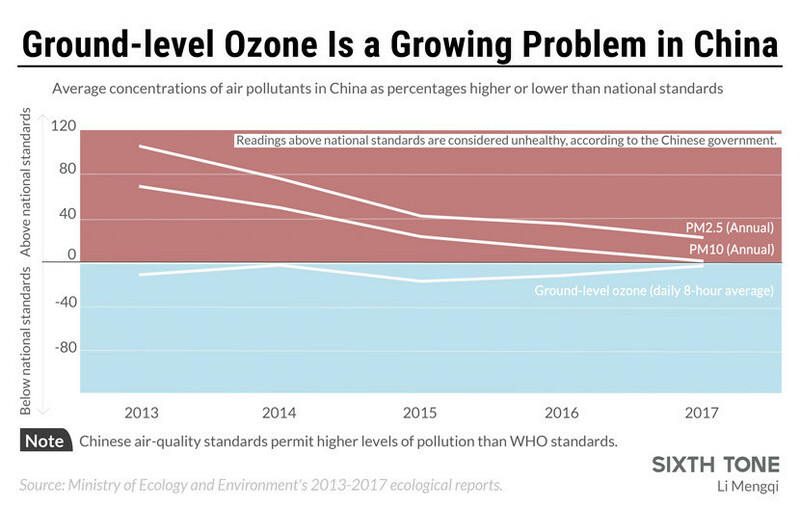 Although the Chinese government’s air-pollution control policies have been reducing atmospheric nitrogen oxides since 2012, they are less efficient at controlling VOCs, leading to a buildup of ground-level ozone. Zhang says that China’s ozone problem is aggravated by the fact that public discussion on air pollution focuses heavily on so-called atmospheric particulates — microscopic solid or liquid matter suspended in the air that contributes to visible smog in the cities. Particulates with diameters of 2.5 and 10 micrometers or less — known respectively as PM 2.5 or PM 10 — are known to be deadly, potentially causing cancer, heart attacks, and respiratory disease. Consequently, the Chinese government has implemented a series of measures that aim to reduce levels of atmospheric PM 2.5 and above, while efforts to cut ground-level ozone levels have stalled. Accordingly, China’s air quality policies prioritize PM 2.5 reductions ahead of ones for ozone, says Hao Jiming, a professor of environmental engineering at Beijing’s Tsinghua University. “Currently, China’s standard for safe levels of atmospheric PM 2.5 is 3.5 times higher than WHO’s air quality guidelines,” Hao explains — a target that certain parts of the country fail to meet, despite the additional leeway. Meanwhile, national standards for ground-level ozone are only 1.6 times higher than WHO and are breached less dramatically, further focusing attention on PM 2.5, Hao adds. Last month, scientists from Harvard University and Nanjing University of Information Science & Technology published a paper showing how China’s war on PM 2.5 has unexpectedly driven up ozone pollution. Normally, the presence of PM 2.5 in the air disrupts the chemical reactions between the free radicals that produce ozone. When PM 2.5 levels fall, these reactions become more likely, and so more ozone is produced. The negative effects on ozone pollution from drastically decreasing PM 2.5 are particularly noticeable in regions like the North China Plain, a former industrial region that has been a key target of pollution reduction in recent years. In their paper, Jacob and his colleagues recommended that China establish effective measures to cut ozone pollution by controlling the release of its precursors — nitrogen oxides and VOCs. But Zhang, the professor at Duke Kunshan, says cutting ozone pollution may be even more challenging than controlling particulates — partly because it’s difficult to identify the origin of ozone pollution in the first place. “Ozone trends are different in different parts of China. Understanding which of the precursors is driving ozone formation in a city or a region is the first step toward ozone control,” Zhang says, adding that research into ozone pollution is dramatically lacking compared with research into PM 2.5. “In many regions, it’s still unclear what’s really causing ozone levels to increase,” he adds. How can China tackle its air pollution problem? Without robust ozone control measures, many Chinese people will likely face greater health risks in the future. Across the country, climate change and global warming are prolonging and intensifying periods of warm weather in which ozone becomes more highly concentrated. At the same time, China’s population is growing older and more vulnerable to the adverse health effects of ozone pollution. “If climate change continues at the current rate, ozone pollution will cause higher mortality rates in the future,” says Chen Kai, a postdoctoral fellow at the Alexander von Humboldt Foundation in Germany. 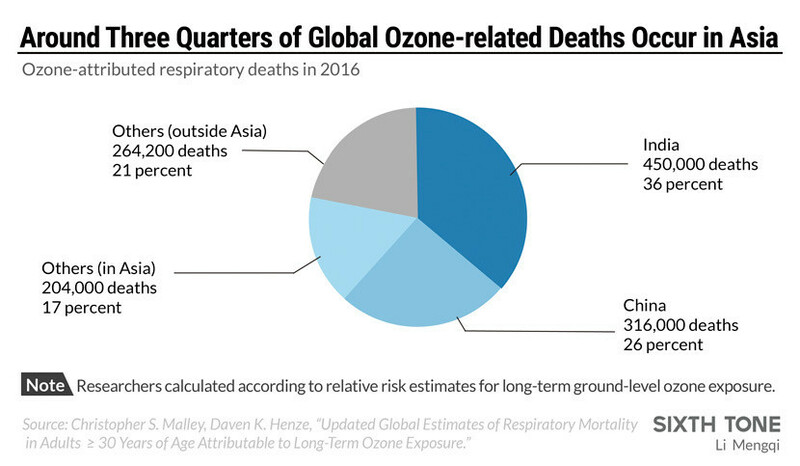 Chen’s research, in collaboration with Columbia University, shows that China’s mortality rates linked to short-term ozone exposure could quadruple within 40 years, due largely to global warming and the country’s aging population. 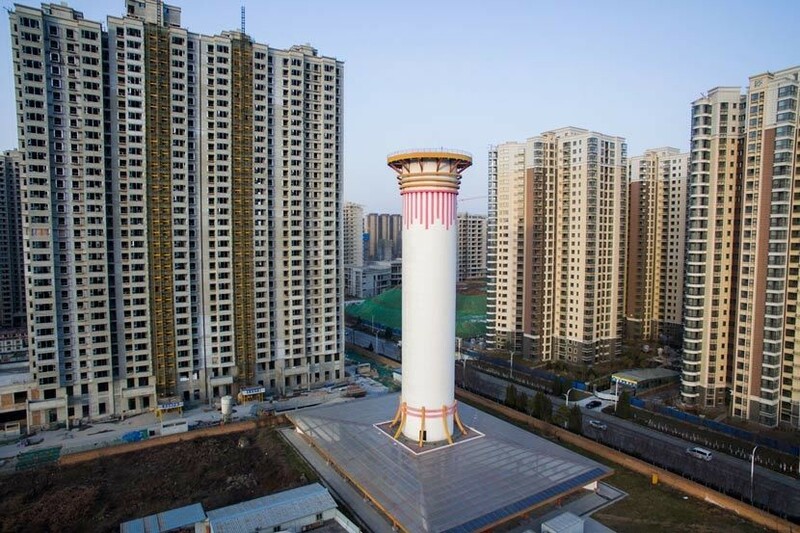 A 100-meter-tall air purifier in Xi’an City, Shaanxi province, Jan. 17, 2018. China’s latest three-year plan to curb air pollution, released in July 2018, does make certain provisions for ozone control, such as compelling manufacturers to repair and replace VOC-emitting installations and applying legal upper limits on VOC concentration in paints, inks, and adhesives. And in the Yangtze River Delta, experts are already teaming up with government authorities to combine controlling PM 2.5 with protecting against excessive ozone by curbing industrial emissions, vehicle exhaust fumes, and coal burning. “If China does not pay enough attention to ozone pollution now, it’ll be tough to tackle it in the future,” Zhang says. This article is brought to you in collaboration with Sixth Tone.